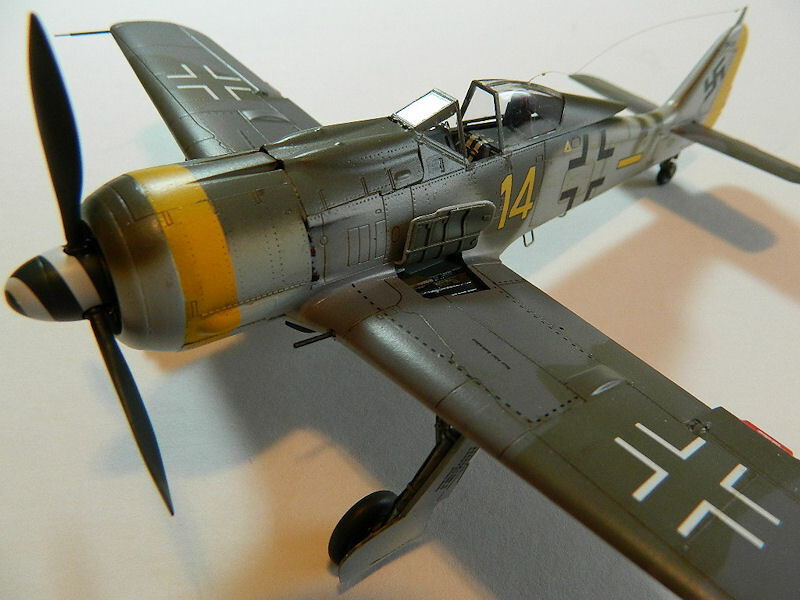 The Fw-190 entered operational service in the summer of 1941 and immediately left its mark on aviation history. Over 20,000 Fw-190s were built in various series and saw service on all fronts during the war. The Fw-190A series was initially designed as a fighter/interceptor, but its performance fell off dramatically at higher altitudes. 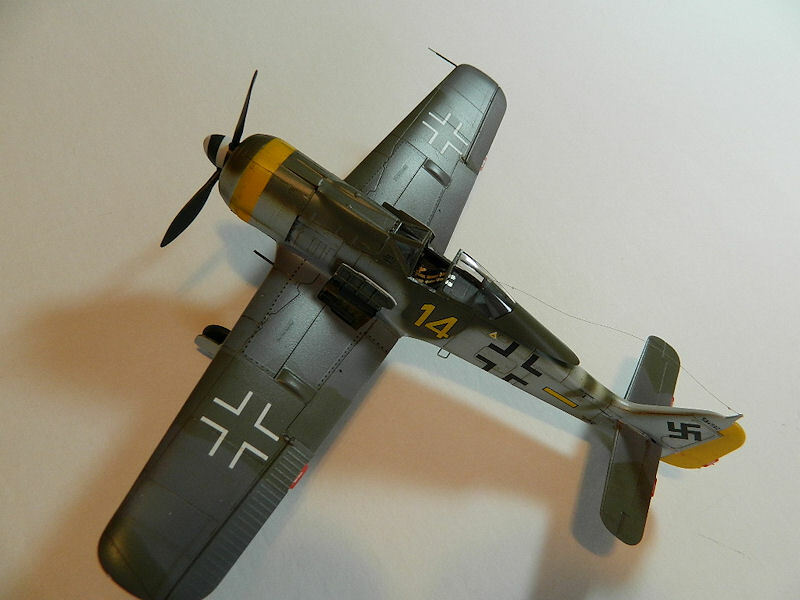 The Fw-190F-8 was designed as a ground attack aircraft and performed this duty remarkable well. 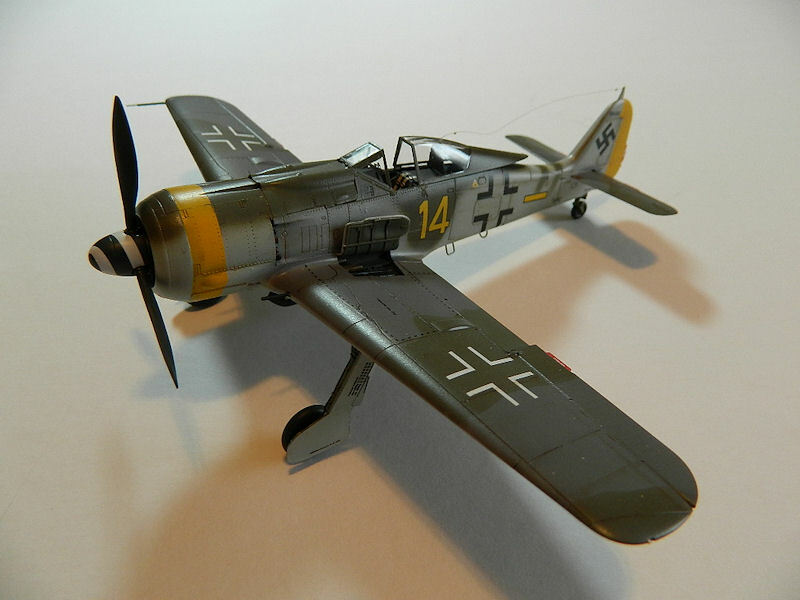 The Fw-190 was also flown by the air forces of Hungary, Romania and Turkey. See the Osprey publication "Production Line to Front Line Focke-Wulf Fw 190" by Malcolm V Lowe for a history of the design and combat of this aircraft. 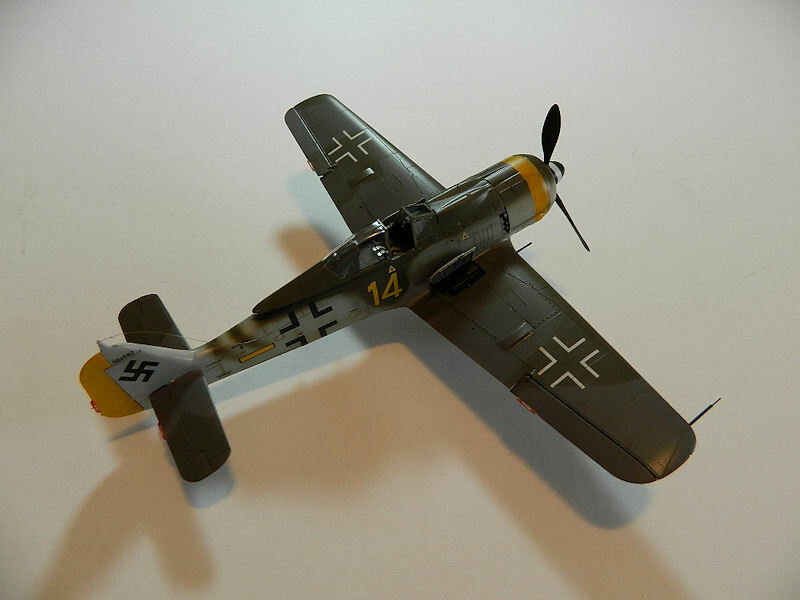 There are twelve pages to the instructions, including a brief history of the aircraft, a sprue layout with the unused parts identified, a Mr. Color paint chart, several detailed, exploded, views that are quite clear in parts location, a stencil layout, and, lastly, markings, stencils and color locations. One of the innovative features of this kit is the stacking sprues. Several sprues are packaged together, but the sprues interlock with integral pegs which prevent the sprues from rubbing together and scratching surfaces or breaking parts during shipment. Bravo, Eduard!! There will be plenty of surplus weapons parts for the spares box. With good references, any number of weapons loads and marking variations could be created from this base kit to please most any taste. There are four canopies included, with three going into the spares box. The model finished to comply with the markings provided would use the blown canopy. There are no photo etch parts included in this kit. Markings and stencils for a single aircraft are included. There are a dozen parts to the cockpit. Dials are raised and will require dial faces for a more realistic impression. I added straps made from Tamiya masking tape to the rudder pedals. There are receiving slots on either side of the fuselage to receive and lock in place the finished cockpit, but some care will be required to assure proper alignment of the rear deck. I painted and detailed the cockpit before fitting it into place between the fuselage halves, and could not resist the urge and need to add PE seatbelts to the seat. The engine cowling is made from several parts that fit together well. Fitting this sub-assembly to the fuselage was a bit tricky. Everything needed to be aligned carefully. The engine itself is a gem, but not much of it will be seen once the cowling is fitted in place. Parts include the two cylinder banks, gear box, and cooling fan plus several exhaust pipes. A jig is also provided for the proper alignment of the exhaust pipes, which is a nice idea, but the fit of the individual exhaust pipes is a bit trying. Most of the longer exhausts must be snaked around the cylinder heads and attached to their individual heads. The single-point attachments makes for a rather flimsy assembly. I glued the engine mounts to the firewall as shown in details on page 7. I next test-fitted the engine and cowling and found the cooling fan extended beyond the circular cowling by about 1/16th of an inch. I trimmed the many mounting nubs off part C33 and tried again. It fit! The wheel wells have several small parts along with the main spar that must be glued in place, with everything generally fitting quite nicely. Care is required to align the individual wing tops to the single piece lower wing. Some pressure was required to close the top wing over the wheel wells main spar. I replaced the wing-mounted cannon barrels, as well as the pitot tube, with brass tube. The kit pitot tube was just not formed that well, and I find drilling openings in small gun barrels just too daunting a task. There are two options for the tail wheel: a single-piece tail wheel or one comprised of three parts. The angle of the main gear is established by mounting slots in the top and lower wing. Another great feature by Eduard. 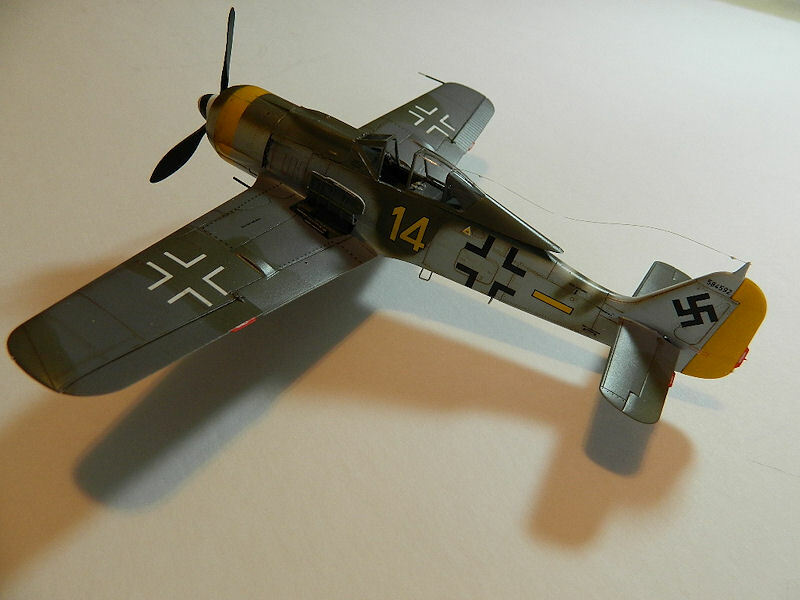 Since there was but a single aircraft to depict, I followed the kit instructions with the paint colors and decals. I started with the underside bare metal panels. This area was airbrushed with Alclad aluminum and allowed to cure for 48 hours. The bare metal was masked and the remaining surface was primed with Rustoleum Painter's Choice flat white. Model Master Acryl and Tamiya acrylic paints were used. The decals include all national markings, as well as the many stencils. The instructions offer a stencil location guide and a guide for the major markings. Two coats of Future floor wax preceded the placement of the decals. Each decal was immersed in water for just a few seconds and was then ready to slide off the paper backing onto the model. The carrier film is minimal and virtually disappears once lightly rubbed with a Q-tip to push the excess water out from under the decal. The decals were finished with an application of Model Master Acryl flat finish. This is the "Weekend" kit, and it probably could be built in a weekend. My efforts were expended in two-hour bursts of effort, and the model was finished in about three weeks. While the majority of the parts fit quite well together, I had fit challenges with the engine components and cowling. The problems with the engine/cowling fit may have been self-inflicted. I would have preferred a simpler engine sub-assembly for a possible better fit, but that is only my opinion. Modelers wishing to show the engine panel open have a great opportunity to paint and detail both the engine and the cowling guns. Built from the box, the end result will be nice model of a historically significant aircraft added to any collection. Highly recommended. I wish to thank Eduard and IPMS/USA for the opportunity to build and review this kit.